Urologist New York, NY | Benjamin C.H. Peng, M.D. 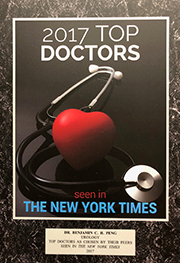 Dr. Benjamin Peng has been selected as one of Castle Connollys New York Metro Area Top Doctors for consecutive years 1999 through 2018. 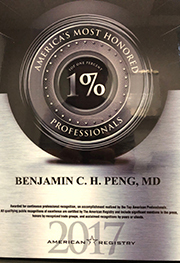 Selected physicians, including Dr. Peng, represent the top 10% of doctors in the area in 65 medical specialties and subspecialties. 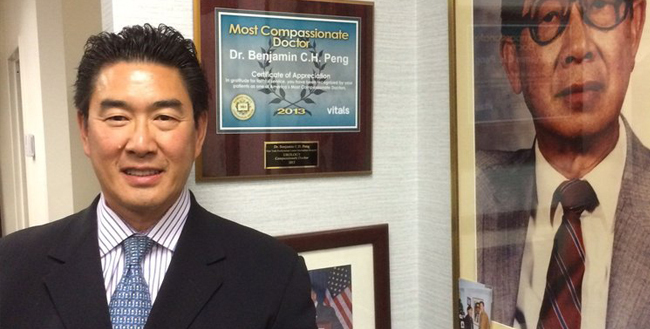 Dr. Benjamin Peng is one of only four sites in New York City approved by the REZŪM company to perform this procedure. The Urolift procedure treats enlarged prostate without cutting, heating or removal of tissue. The practice of Benjamin C.H. Peng, M.D. 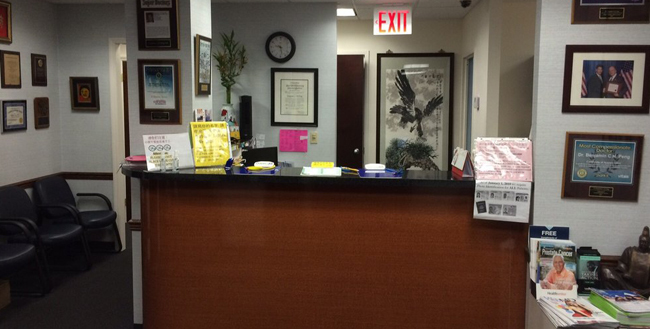 serves New York's Chinatown, Wall Street, and lower Manhattan communities with the highest quality urological care. Medical care is available in Mandarin, Cantonese, and Spanish as well as English. To set up an appointment, please call our office. 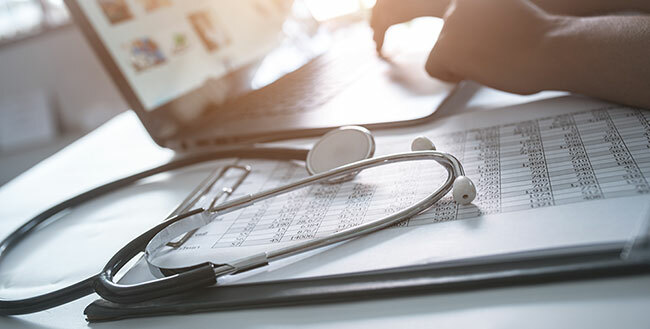 Dr. Benjamin Peng was trained at Columbia University Medical School and Urology Department and he has been in private practice since 1990 when he took over his father's busy urology practice. He offers multilingual care to a diverse group of patients, from Wall Street, Chinatown, the Tri-state and now all over the world, due to his social media reach and TV reputation. Early in his career Dr. Peng challenged himself with responsibilities such as being Chief of Urology and a Board of Trustee member at New York Presbyterian Lower Manhattan. He now enjoys maintaining an efficient practice, while emphasizing the traditional, compassionate physician patient relationship. Dr. Peng is a native of Manhattan and an active member of many area professional associations and IPA administrative committees. 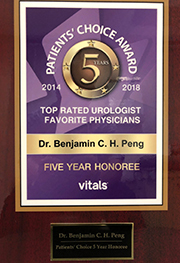 Dr. Benjamin Peng's office has been designated as a center of excellence for minimally invasive office management of BPH with technology such as REZŪM® and UroLift®. The use of new self hand held nitrous oxide anesthesia will facilitate comfort during minor office procedures and surgeries. Dr. Benjamin Peng specializes in general adult and pediatric urology, with particular interest in prostate disease, kidney stones, male infertility, erectile dysfunction, incontinence and urological oncology (bladder, kidney, prostate and testicular cancers). Dr. Peng strives to treat each patient as an individual while also working to make healthcare better for the whole community. 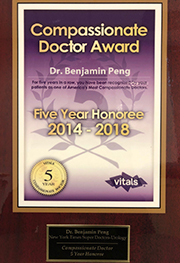 In May 2018 the Chinatown Health Clinic Foundation awarded Dr. Peng the Community Physician Award for his decades of "leadership and dedication towards improving the health and well-being of the Asian American Community." Dr. Peng is the secretary for a 1000-physician Chinese-American IPA, and he is active in the quality assurance and utilization review process for the physicians' participation with various managed care insurance plans. Dr. Peng was recently featured on an international TV show explaining evaluation and new treatments of BPH- enlarged prostate.